I recently got another switch and connected it in living room to be able to hard wire in more devices. When I connect the second switch I lost internet on all devices. Both switches are connected to wall panels which are connected back into the router via a network panel in a closet. 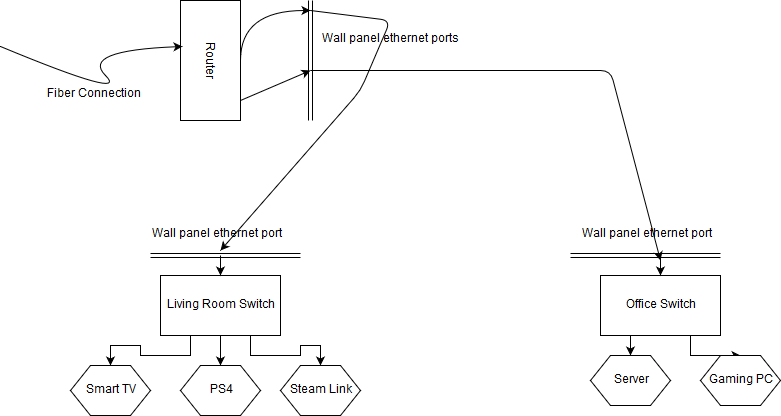 Before having this setup, the Steam Link was hardwired into the wall port and the PS4 and Smart TV were connected via wi-fi coming from a second router that was connected to the office switch. The router that gets the fiber connection has its wi-fi mode turned off and just serves to provide the fiber to the other rooms. All of the ports on both switches light up green like they are receiving traffic but I'm getting no internet access. As soon as I unplug the switch in the living room internet access returns. Any ideas as to what could be causing the problem? Edit: With the switch confirmed working and a loop being ruled out you need to make a more thorough survey of the connections. Usually, the activity LEDs should only indicate very low traffic levels. If you see a sudden increase when connecting one of the devices then something is wrong with that device. Another possibility is a configuration collision with one of the devices and the router. Try connecting the otherwise empty switch and then connect the devices one by one, checking Internet connectivity each time and waiting a few minutes for problems to come up. Not the answer you're looking for? Browse other questions tagged networking router switch or ask your own question. Multiple wifi routers, interconnected through ethernet, to improve coverage? What's wrong with my home networking setup?